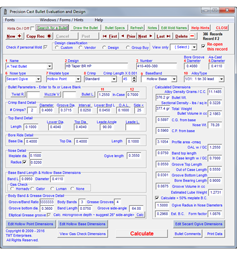 Precision Ballistics Software provides new, user friendly, load and accuracy evaluation tools. 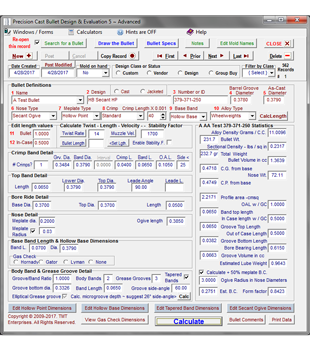 Precision Ballistics may be installed as a companion module of Precision Load Records Software. 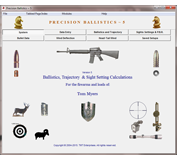 All calculations use highly accurate numerical integration algorithms to calculate downrange ballistics, bullet drop, trajectory and time of flght charts and tables. Sight elevation and windage setting and zero adjustments procedures keyed to the selected firearm. Headwind, tailwind and sidewind deflection values. Bullet stability factor and spin drift calculations. Terminal ballistics and trajectory comparison charts. 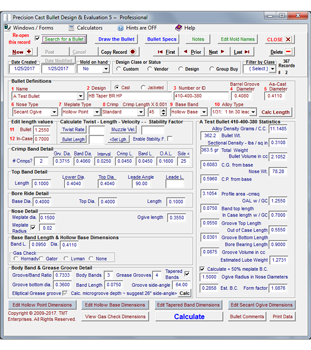 Individual firearm sighting systems and vital statistics may be stored and retrieved. Stored setups for range distances and load specifics that are keyed to each firearm. 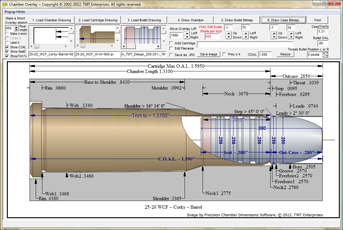 Optional imaging feature for bullet identification. Approximately 1,000 jacketed and cast bullet listings are stored. Many bullet records include published ballistics coefficient values. New features include bullet stability, spin-drift, wind vector value calculations and charts of head-wind, tail-wind, side-wind and spin-drift deflection and sight adjustment values.